In the 15th century, when Europeans first began moving people and goods across the Atlantic, a microscopic stowaway somehow made its way to the caves and monasteries of Bavaria. The stowaway, a yeast that may have been transported from a distant shore on a piece of wood or in the stomach of a fruit fly, was destined for great things. In the dank caves and monastery cellars where 15th century brewmeisters stored their product, the newly arrived yeast fused with a distant relative, the domesticated yeast used for millennia to make leavened bread and ferment wine and ale. The resulting hybrid — representing a marriage of species as evolutionarily separated as humans and chickens — would give us lager, the clear, cold-fermented beer first brewed by 15th century Bavarians and that today is among the most popular — if not the most popular — alcoholic beverage in the world. And while scientists and brewers have long known that the yeast that gives beer the capacity to ferment at cold temperatures was a hybrid, only one player was known: Saccharomyces cerevisiae, the yeast used to make leavened bread and ferment wine and ale. Its partner, which conferred on beer the ability to ferment in the cold, remained a puzzle, as scientists were unable to find it among the 1,000 or so species of yeast known to science. 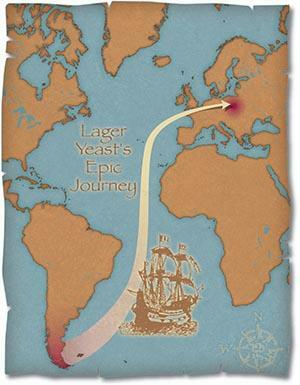 Now, an international team of researchers believes it has identified the wild yeast that, in the age of sail, apparently traveled more than 7,000 miles to those Bavarian caves to make a fortuitous microbial match that today underpins the $250 billion a year lager beer industry. Writing this week (Aug. 22) in the Proceedings of the National Academy of Sciences, researchers from Portugal, Argentina and the United States describe the discovery of a wild yeast in the beech forests of Patagonia, the alpine region at the tip of South America, that apparently solves the age-old mystery of the origin of the yeast that made cold-temperature fermentation and lager beer possible. "People have been hunting for this thing for decades," explains Chris Todd Hittinger, a University of Wisconsin-Madison genetics professor and a co-author of the new study. "And now we've found it. It is clearly the missing species. The only thing we can't say is if it also exists elsewhere (in the wild) and hasn't been found." The newfound yeast, dubbed Saccharomyces eubayanus, was discovered as part of an exhaustive global search, led by the New University of Lisbon's José Paulo Sampaio and Paula Gonçalves. Aimed squarely at resolving the lager yeast mystery, the Portuguese team sorted through European yeast collections, combed the scientific literature and gathered new yeasts from European environments. Their efforts yielded no candidate species of European origin. Expanding the search to other parts of the world, however, finally paid dividends when collaborator Diego Libkind of the Institute for Biodiversity and Environment Research (CONICET) in Bariloche, Argentina, found in galls that infect beech trees a candidate species whose genetic material seemed to be a close match to the missing half of the lager yeast. 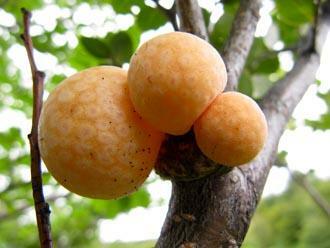 "Beech galls are very rich in simple sugars. It's a sugar rich habitat that yeast seem to love," notes Hittinger. The yeast is so active in the galls, according to Libkind, that they spontaneously ferment. "When overmature, they fall all together to the (forest) floor where they often form a thick carpet that has an intense ethanol odor, most probably due to the hard work of our new Saccharomyces eubayanus." The new yeast was hustled off to the University of Colorado School of Medicine, where a team that included Hittinger, Jim Dover and Mark Johnston sequenced its genome. "It proved to be distinct from every known wild species of yeast, but was 99.5 percent identical to the non-ale yeast portion of the lager genome," says Hittinger, now an assistant professor of genetics at UW-Madison. The Colorado team also identified genetic mutations in the lager yeast hybrid distinctive from the genome of the wild lager yeast. Those changes — taking place in a brewing environment where evolution can be amped up by the abundance of yeast — accumulated since those first immigrant yeasts melded with their ale cousins 500 years ago and have refined the lager yeast's ability to metabolize sugar and malt and to produce sulfites, transforming an organism that evolved on beech trees into a lean, mean beer-making machine. "Our discovery suggests that hybridization instantaneously formed an imperfect 'proto-lager' yeast that was more cold-tolerant than ale yeast and ideal for the cool Bavarian lagering process," Hittinger avers. "After adding some new variation for brewers to exploit, its sugar metabolism probably became more like ale yeast and better at producing beer."